Spammers on Facebook: Are You Feeling Lonely? Recently, Facebook, due to its vast popularity, has become the hub of unethical marketers. These marketers don’t care spamming almost anyone on FB. Among all the social media networking platforms FB alone has near about 600 million users making it the most lucrative platform for those outbound marketers who always need a good list to survive. Touching Line: In this Article, I am concentrating on the malicious links that spammers are using very creatively by playing with the sentiments of being alone and being admired on social networks. Among all the techniques and baits that these marketers and spammers use, the most compelling one that me and my (SocialMediaSimplify) teammate experienced recently is based on the sentiments of being alone and being the admired one in Facebook. Yes, it’s an individualistic sentiment that every human being possesses. What’s going on: This sentiment really haunts everyone. Users are looking for the mental satisfaction that they are not alone and they are being followed and admired. As a result, these spam links promising to show your recent profile visitors are on high rise in Facebook. 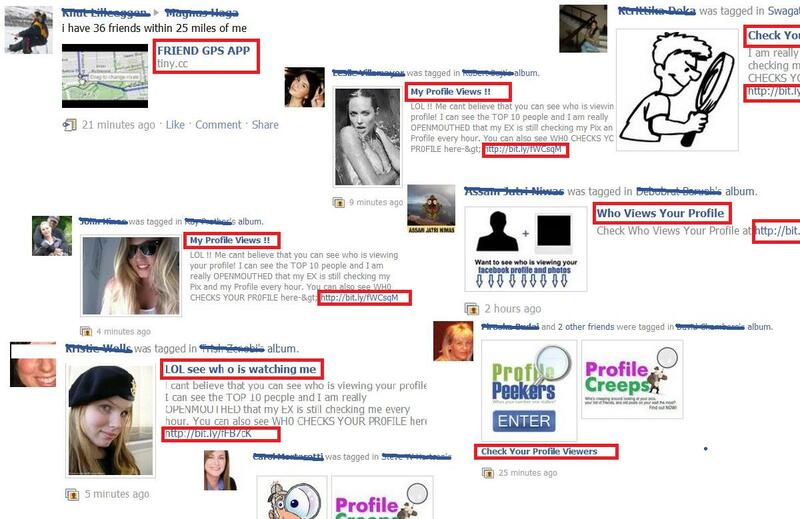 How is it spreading: Most people have become the soft targets of such baits and techniques running on social media giant Facebook, as most of them want to know who has visited their profiles recently! Out of this curiosity, related to the sentiment mentioned above, they click on the links and grant permission to the apps to access their profiles throughout. Instantly, these apps then turn it to an update in the form of some common outlines and pictures to tag and target the recent people whom the profile owner has interacted with very recently. And it is obvious that when we see our friends using such an app our perception automatically appears to be positive for that. As a consequence we end up clicking and granting access to those malicious apps. What next: Before I elaborate this point, let me stretch you to the point that by now, you, me and a handful of our close friends (who are on FB) already have added our postal address, phone numbers, our likes & interests etc. to our personal profiles. Obviously, these are the details someone as a marketer dies for. So, what do you think… where would those huge data go? Yes, the access we grant to the apps on FB acquires these data and in turn you get all those (mostly) unwanted mails to your inbox and the marketing calls despite being registered on a do not call directory. Precautions: It is being said that the Facebook users are the most tech savvy people on earth. So, let’s prove it 300% right and contribute to a better and safe experience on FB. Whenever you see a suspicious link on FB, don’t forget to report it as a spam. Remember that every contribution counts in such a case. In case, some of your friends in FB become a victim of such a malicious link, just inform him of the event and help him taking the access off by visiting the link: https://www.facebook.com/settings and clicking on ‘Edit Your Settings’ option present under ‘Apps and Websites’ on the bottom left. And by far more, you can always contribute to a safer Facebook or any other social media platform experience simply by following the basic rule of social media – The Sharing is Caring. So, if you get it (or have it), share it. This is a type of Vulgarity which has been added on Fcaebook and its astonishing to know that there are ads pertaining to single women looking for company which is also accompanied with Vulgar photos and thus it leaves a friend on Facebook aghast It was in your comment you spelled out the same but it is going on for yesrs. who shall bring a end to it. @Pullin ji - Yes, you are right. In-fact, there are many others working on this very profitable apps part. These apps are really hampering the goodness of networking possible through social media. And together, we can stop it. Whenever we see a malicious link or APP on FB, we should report it as a spam by clicking the X mark present on its right top. And keeping our friends updated about such malicious links is the next thing we should do. Thats how it can be stopped.